Beloved husband of the late Lena. Loving father of Judith (Steven) Darr, Raymond (Mary), and Linda (Tony) Cimarusti. Cherished grandfather of Anthony, Caryn, and Lori (Mike). Devoted great-grandfather of Jeffrey and Stephanie. Dear brother of Betty Bartuch, the late Armand, and the late John. Fond uncle and friend of many. World War II Veteran and Schiller Park Policeman known as "Radar Ray". Member of the Mazzini Verdi Club, Schiller Park American Legion Post 104, and Knights of Columbus Ava Maria Council. Visitation will be held on Thursday, January 24, 2019, from 3:00pm to 9:00pm. Family and friends will gather for prayers at 9:30am on Friday, January 25, 2019, at Sax-Tiedemann Funeral Home, 9568 Belmont Avenue, Franklin Park, Illinois, 60131. 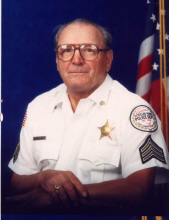 A 10:00am funeral mass will follow at St. Beatrice Church, 4157 Atlantic Avenue, Schiller Park, Illinois, 60176. Interment at St. Joseph Cemetery, 3100 Thatcher Avenue, River Grove, Illinois, 60171, to follow mass. For more information, please contact Sax-Tiedemann Funeral Home & Crematorium at 847.678.1950 or go to www.sax-tiedemann.com. "Email Address" would like to share the life celebration of Raymond A. Gennetti. Click on the "link" to go to share a favorite memory or leave a condolence message for the family.